This World Heart Day, our focus is on creating healthy heart environments. Its observed on every year September 29. 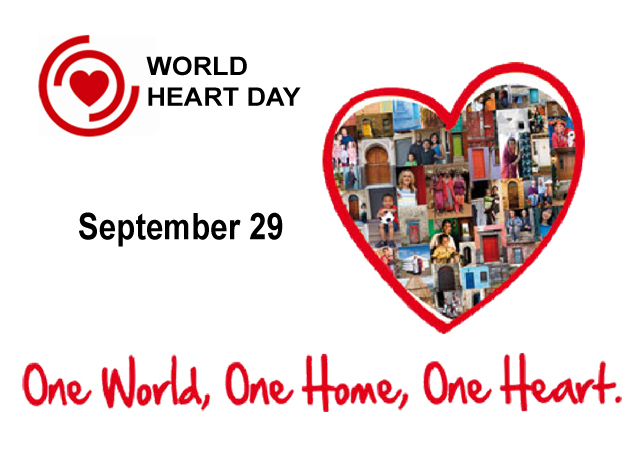 By ensuring that everyone has the chance to make healthy heart choices wherever they live, work and play, World Heart Day encourages us all to reduce our cardiovascular risk, and promotes a heart-healthy planet for those around us. There are many ways to get involved, from planning your own World Heart Day event to sharing your Healthy Heart Selfies (a photo of yourself making the heart symbol, just like our campaign image!) on our Twitter and Facebook pages. Please help us to give everyone, everywhere the right to make healthy heart choices. Keep visiting this website regularly for more updates and information! The World Heart Federation traces its origins to the International Society of Cardiology, which was formed in 1946, and the International Cardiology Federation, founded in 1970. These two organizations merged in 1978 to form the International Society and Federation of Cardiology (ISFC). The ISFC changed its name to the World Heart Federation in 1998. The World Heart Federation is the world’s only global body dedicated to leading the fight against heart disease and stroke via a united community of almost 200 member organizations that bring together the strength of medical societies and heart foundations, from more than 100 countries covering the regions of Asia-Pacific, Europe, East Mediterranean, the Americas and Africa. Raised blood pressure, cholesterol and glucose levels. Inadequate intake of fruit and vegetables. World Heart Day was created to inform people around the globe that heart disease and stroke are the world’s leading cause of death. Together with organizations such as WHO, the World Heart Federation spreads the news that at least 80 percent of premature deaths from heart disease and stroke could be avoided if the main risk factors – which are tobacco, unhealthy diet and physical inactivity – are controlled. World Heart Day started in 1999 and is held on the last Sunday of September every year. We believe that everyone, regardless of geography or socio-economic status, deserves equal access to a health-enabling environment, health information, treatment and care so that all people across the globe can lead a heart-healthy life.